Is A Kidney Lesion Something to Worry About? Just hearing the term kidney lesion may be enough to strike fear into the hearts of many Americans. Unknown medical phrases like kidney lesion or spot on the kidney bring up unnerving pictures of tumors and cancer. Luckily, the medical technology of today has made it possible to thoroughly examine and diagnose spots or lesions found in the kidneys and in other areas of the body. And early diagnosis of most medical problems can lead to a positive outcome, even when the cause does turn out to be cancer. Kidney lesions are generally noticed during a routine CT scan, usually for some other problem. Pain from kidney stones or gallstones will often send the sufferer straight to the emergency room, where medical professionals will perform a number of scans to try and determine what is causing the pain. A scan will not always get a clear picture of the kidney spots or lesions, however, so the doctor may inform the patient that they may have a spot or a lesion but it cannot be positively verified. It is not uncommon for the physician to tell the patient to come back into the office in 4 to 6 months for a recheck to see if the lesions or spots are still on the kidney or if they have changed in any way. The waiting game does not always bode well with a concerned patient, but lesions in the kidney are not always a cause for concern. In fact, something that appears to be a spot or lesion on the kidney can wind up to be just fatty tissue or scarring that will be perfectly harmless. This is why the doctor recommends a return visit – to keep an eye on the area and make sure it does not turn out to be something serious. Even if lesions or spots turn out to be a sign of a bigger problem, having discovered them early on will frequently be beneficial when it comes to treatment and recovery. There is no certain evidence that lesions in the kidney are a sign of cancer. Still, if your doctor has concerns about something they have seen in a scan, it is a good idea to set up a follow-up examination. 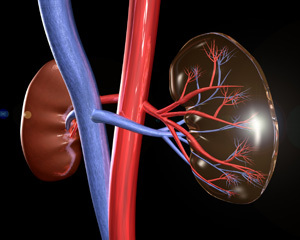 It is thought that kidney lesions may be a sign of a kidney problem known as nephrosis. This is an unusual illness that stems from a number of different symptoms and seems to be caused by excess protein in the kidneys. The extra protein could be an indicator that the kidney is having problems processing protein and other nutrients properly, which can be quite problematic since the function of the kidneys are vital to good health. It is the job of the kidneys to act as a filter for our bodies, absorbing nutrients from the foods we eat and liquids we drink, and processing these vital substances for use in our bodies. If the kidneys are not performing their filtering duties correctly, serious problems could result, not the least of which could be permanent damage to the kidneys. Sometimes nephrosis comes about suddenly and seems to be a temporarily affliction that goes away on its own over time. Other times the doctor will prescribe a course of treatment to help the kidney recover and return to normal functioning. As with any illness, it is vital to see a qualified medical professional for proper diagnosis. Serious illnesses should always be handled with a sound mind, by those who are trained in health care and healing.